When I was a kid in elementary school we used to give out cards on Valentine's Day and that was it. Most of our cards were homemade, with only a few kids handing out store bought cards. Not anymore, now kids get cards with pencil and eraser sets, toys, candy, etc. Our school has a "no candy" policy, so I decided that this year we should make something to give out instead of store bought cards. 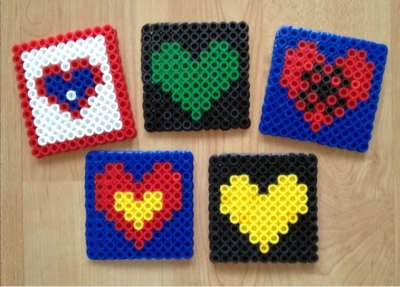 My 7 yr. old is really into Perler bead crafts right now, and I had recently stumbled across this Perler bead idea on Pinterest, so we decided to give it a try. 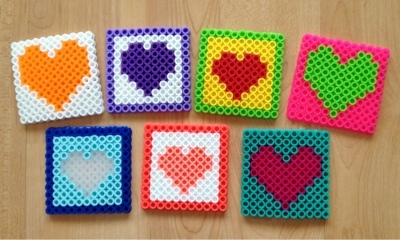 It took us two evenings of beading to make enough for all the kids in her class. We did the girl's first, but I realized that the boys probably wouldn't want such girly looking valentines, so I decided to come up with my own super-hero themed designs. My daughter asked the boys in her class who their favourite super-heros were, and then we worked on coming up with designs that incorporated their colours and emblems. Can you guess which valentine goes with which super-hero? That is sooooooo fantastic! What a great idea!